�����Britain leaving the EU has sent shockwaves throughout the world economy, which includes the metals market. Brexit was just the push needed to send Gold past the $1300 mark. But what does this mean for rare coin prices? �����With most investors running toward bullion related coins, many astute collectors will be looking to pick off future rarities at today's reasonable levels. Over the last two years we have seen a downturn in values for most series due to reduced demand and a dwindling collector base. The flight toward bullion has hastened this downturn. �����So what are long time collectors doing to take advantage of today�s lower prices? Below is a variety of approaches dealers and collectors will use in developing their long-term plans. �����Low mintage coins are always a good place to start. They will not be plentiful, and depending on attrition and possible melting by the government, availability will be typically much less than the original mintage. �����Within each date, as the quality increases, the number of coins in the higher grades is proportionately smaller. Therefore the value of low population coins increases substantially. �����Tight price spreads between grades can lead to future profits. Here is an example: The 1894 Barber Quarter in PR65 and PR66 has an FMV of $1,840 and $2,340, respectively. There are 109 coins certified by PCGS and NGC in PR65 with just 59 in PR66. There are only 40 coins that are certified higher than the PR66. �����Coins that have a consistent collector base and positive track record over the years are a good choice. Popular series coins and known rarities have a history of market cycles to study the ups and downs; as the stock market saying goes, �buy low, sell high�. Count on these coins to get hot at some time in the future. A good example here is Morgan Dollars: when they get into a solid run, it is very difficult to buy accurately graded coins at reasonable levels. 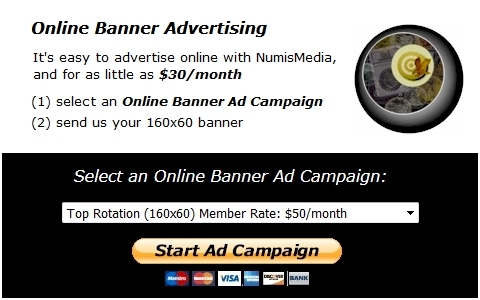 �����Buyers will track coins that have retreated in value in recent years. 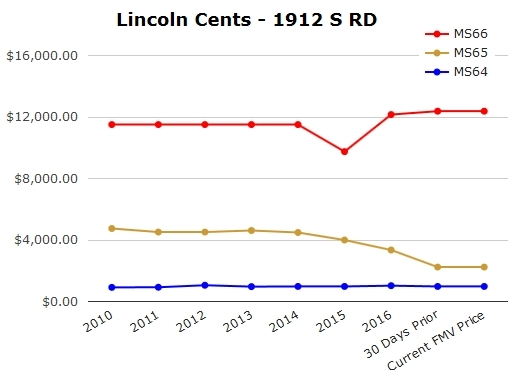 Look at the 1912 S Lincoln Cent in MS65 Red. This coin has a population of only 109 in MS65 with just four coins certified higher. While this coin does have a large spread between grades for obvious reasons, the fact that it has dropped over the last several years affords potential buyers an opportunity to acquire a better-than-average coin at a bargain price. The graph below shows the cycle for the 1912 S MS65 Red from 2010 to today. The FMV has fallen from $4,750 to the current $2,240. �����CAC and + coins are very popular, many appearing on dealer sell lists and heavily bid on at auction. In some cases they are priced near current levels as if they were not labeled with these designations. The majority of these coins are top quality coins, and when the market for a particular series gets hot, the coins with these designations should command a nice premium. �����Buyers in this market need to be flexible; many have a fixed amount of money to invest in rare coins. When one or more desired coins become available, buyers must be ready to make a purchase. �����Each collector and dealer will have their own system for their numismatic endeavors. Most will select the coins that make the most sense for their budget. Below is a list of coins that have fallen in value over the last year or so, some are down as much as 44%. �����The coins listed above are not recommendations; they were selected because of their past demand and popularity by collectors and the fact that they have dropped in value a substantial amount recently. Just because the FMV has dropped for these coins does not necessarily make them a leading candidate for acquisition. Researching the populations for the specific grade and for the grades above will be crucial in determining potential profits. There are hundreds or even thousands of other examples that further study will identify future rarities. �����Because of the flight to bullion coins, including the amount of money used to purchase coins directly from the mint, the amount of money spent on rare coins has definitely diminished over the last couple of years. Add to that the cost of submitting thousands of modern bullion coins to the grading services, costs that also reduce the volume of available cash to be spent on rare coins. This leaves many coins unsold and eventually discounted, thus creating the declines in Fair Market Value.